No lazy moving men for this furniture company, apparently! Why, since the rest of the sticker is in traditional characters, is “只” simplified? The dictionary tell me that the traditional form of “只” is “隻.” Any insights? 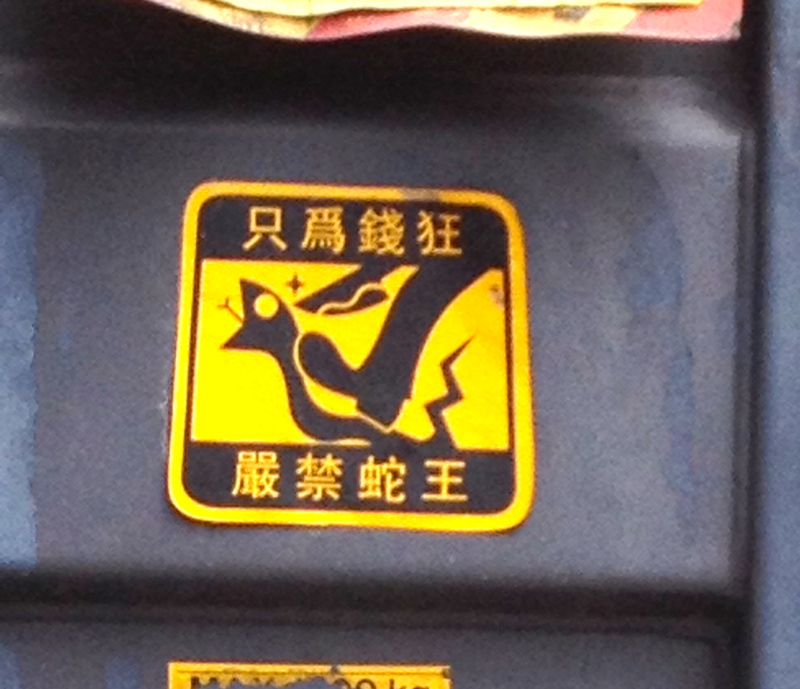 Isn’t this a much cooler image than the still ubiquitous (at least in Hong Kong) “baby on board” sticker? I have two children and yet the circa 1980s “baby on board” sticker simply makes me want to ram any car displaying it. As you read this, I am in Yunnan, China where the forbidden fruit of WordPress blogging (and Facebook and Twitter) are blocked by the patronizingly paranoid Chinese government. Too short a trip to bother with a VPN circumvention, but I’ll be back in touch soon. ← Learn from the Chinese: Dos and Don’ts for American tourists abroad? Interesting! I hadn’t thought of interpreting it that way at all. Thanks for the additional possible insight! The bottom four characters mean: Lazy bumps (lazy people) Seriously Prohibited” or “No Lazy Bumps/sloucher”. Snake King, the last two character, usually mean king of snakes. However, in Cantonese, it also mean lazy people. I think it means “lazy people” in this context. 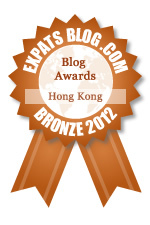 I checked/confirmed with a native HK person. Hooray! Glad my stab in the dark wasn’t completely off base. Thanks to you (and your wife and her coworkers!) for taking the time to look at this and offer your ideas! 1) 只 when it means ‘only’. 2) 隻 when it’s a counter for certain animals. So in this context 只 is traditional meaning ‘only’. Ah ok! Interesting. Thank you for taking the time to explain. This makes sense (and is something that was not clear in any of the references I was checking: Pleco and a paper dictionary). I can’t help you with the Chinese but I have all the sympathy for the Baby on Board thing. I hate them! New trend here: making it personal. Apparently the sticker “Johanna on board” is much more effective than a generalized “Baby”. LOL. Oh dear! Maybe we should all also list our endearing qualities on our bumpers to encourage other drivers to bother not to hit us! Funny. I have no idea what that means, but it’s epic and I am 100% behind whatever message it’s sending. Ha! The image is dramatically awesome, right? 只 is not a simplified word. The dictionary reference of traditional form might have meant the usage of the word instead of classical vs simplified version of the word. The word has different meaning depending on the context of the sentence and in this case it meant ‘Only’. The same word is also used to describe the number of animals in a sentence (as in 1, 2, 3 ‘只 ‘ dog etc) and is interchangeable with 隻. 隻 is mostly used in Cantonese in this case. Mandarin can use either one but I think 只 is used in more traditional settings. 蛇王 translates literally to ‘snake king’. You’d likely see them on signs outside restaurants specializing in snake soup in HK. It is also a Cantonese slang for lazy bum or laggard. The Canto slang for human smugglers is 蛇頭 or ‘snake head’ and could be easily mistaken for the former. Based on the context of the words on the sticker I will have to agree with your interpretation. Thank you very much for taking the time! The explanation that this form of ”只” is a traditional form is very interesting (and was not at all clear in the resources I was consulting: Pleco and a paper dictionary). Very helpful. Well, I agree with the first part of the statement that the “person” is crazy for the money (money hungry, greedy) – but I don’t know the Cobra King part and probably it’s a slang or colloquialism and not a literal translation. I do remember you said there are snakes where you live in HK. Just don’t sell them for cash, OK? Looks like there are some mighty harsh consequences. Since the comments above indicate a few possible meanings, perhaps there is also a completely different meaning that can be deduced from Taiwanese-based Chinese speakers? Can your dad consult a few neighbors? 😉 I’m sure they’ll come up with 10 additional theories.